May I request your help? Pavel Nedev has been doing wonders to the Compare Plugin. 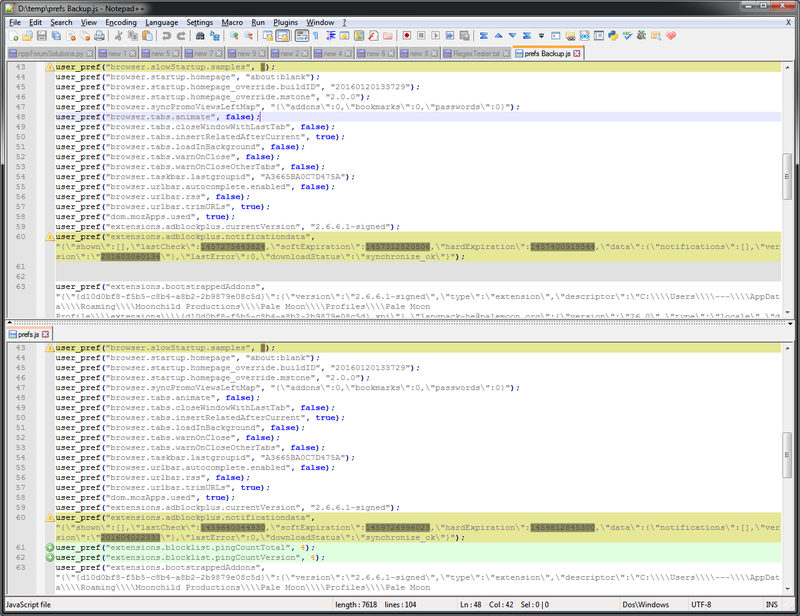 Building the plugin (currently latest commit) with VS 2013 Community it works properly. Building it with my VS 2013 Express I get this issue. Check View -> Wrap in NPP. 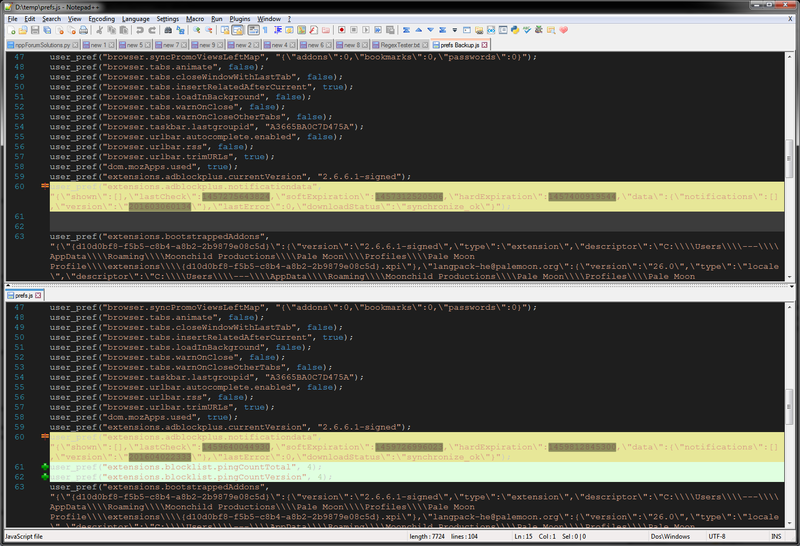 Place prefsBackup.js in the top panel and prefs.js in the bottom. Do you get correct or wrong results? If you get correct results, could you think of any reason I get them wrong? And if you get wrong results, why does it work properly when built with VS 2013 Community? I assume I get the correct result as I see two empty lines. Actually I don’t think that it is compiler related but I might be wrong. Also I tried it with your scilexer.dll - same result. The problem started with this commit. If it’s not too much trouble, would you be kind enough to test it? (Yours). Brilliant. :) I thought about that too. Thank you very much. I am grateful. Oh, didn’t saw that it was different repository. Downloaded pnedev’s version, compiled and run -> same result. Can you try the little test I suggested? Thanks again. I highly appreciate it. I get the same wrong results with your test. You have the WinDDK 7.6.1 installed, correct? from compare plugins point of view it isn’t a problem. You might asking - what? by adding two eols(\r\n) and change background color to grey. Well the background color has been set to grey for two lines, just one eol disappeared. plugin that it exists in both files. into one? And this conflicts now with compare plugin? I’m afraid I haven’t made myself clear enough. The same source code built by someone else (and uploaded to the Compare repo) works as expected on my machine with the exact same settings. That DLL was built with VS 2013 Community and hence my initial idea of some difference between VS Express and VS Community. After you have kindly built the code with VS Express and got correct results that explanation seems irrelevant. A wrong setting in my VS Express? And a long shot: is it possible that it only works properly when built on Windows 64-bit? Thank you very much. I do appreciate your help. ** I won’t be by a PC until Wednesday or Thursday. 32bit/64bit hmmm, could be a culprit. Can you upload the faulty compare dll? I meant some wrong/corrupted setting in general. Apropos: when I open the Compare.sln file, I need to change the default Debug setting to Release. Is that normal? My OS is Windows 7 32-bit. Thank you very much. I appreciate your kindness. I can confirm the reported behavior with your dll, even on my Win7 64bit. Regarding the Debug/Release what do you mean you NEED TO change it? Is something not working if you build the dll with Debug profile? With Debug profile the created dll is much bigger as it has additional debug information. create a lighter (smaller) version of the dll. So the question is, what happens on your system when compiling the system. As said, the project specific settings are stored in sln and project files. which could lead into the situation that such setting would delete a \r\n char. When you compile the source do you get any error or warning message? git tools like git and tortoisegit? If using git tools do you pull from master branch? If using tools, what does commit show if you right click on the directory of the repository? In the meantime I will try to see what your dll can tell me. Thank you so much. Highly appreciated. My long shot was a difference between building the DLL on 32 or 64. Debug/Release: I meant to ask if the default setting on opening the file was Debug. I don’t get any errors or warnings. I download the current zip (master branch). If I hover over an older commit’s <> button (Browse the repository at this point in the history), download the up-to-then source code and build it - I get correct results. I don’t think so, but bugs could be anywhere. 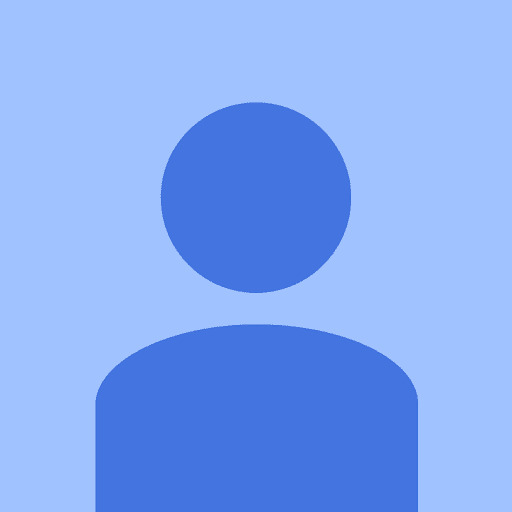 Yes, as this it the main profile a developer works with. If I hover over an older commit’s <> button (Browse the repository at this point in the history), download the up-to-then source code and >build it - I get correct results. Which commit did you use? What about if you use the latest one? Using the latest commit - wrong results. A few minuets ago I downloaded the source up to this commit and got correct results. I think the problem started here. I can test again and verify it. Yaron, could you post your compare.ini? The problem starts in this commit. This is were I currently investigate, to be more precise I assume the issue in addBlankSection. I was about to start investigating it myself; I was overwhelmed by the scale of the unfamiliar code. It might be that this was a hasty reaction as it could be that the function already got the wrong value. you need to do some debugging as well. But not for today, I need to have a rest. Maybe we can go on tomorrow? I hope you’re reading these lines after having a good and refreshing rest. I find it difficult to enlarge the variety of my thanks expressions. I’ve never used the Debugger.